Ahlstrom Hollow (400 acres): The legal description includes all or part of sections 16-20, 26 and 35, township (T) 36 south (S), range (R) 4 west (W); sections 13 and 24, T.36S., R.4 ½ W., SLC meridian. Sunset North (200 acres): The legal description includes all or part of sections 14-9, 17, and 18 township (T) 35 south (S), range (R) 3 west (W); sections 31 and 32, T.34S. R.3 W., SLC meridian. Dave’s Hollow (300 acres): The legal description includes all or part of sections 16-20, 26 and 35, township (T) 36 south (S), range (R) 4 west (W); sections 13 and 24, T.36S., R.4 ½ W., SLC meridian. 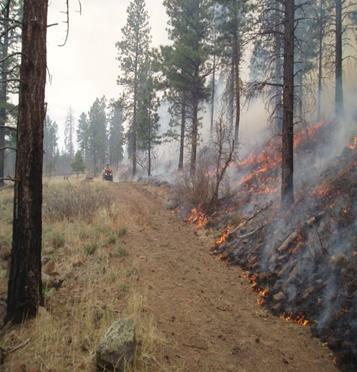 Additional prescribed burns are ongoing through May in the Cedar City Ranger District. The purpose of these projects is to improve forest health. The long-term vegetation goal is to move toward the properly functioning condition and return fire to its natural role in this area. Fire return intervals for this vegetation type vary from five to 15 years; however, much of the area has not been burned for over 100 years. The goal is to restore fire back into the stands and improve the pine forest, as well as brush (manzanita and bitterbrush) understory to improve overall forest health. Fire crews and resources will be on scene to prepare, ignite and hold the prescribed fires in predetermined locations. Once ignition has been completed, firefighting personnel will continue to patrol and monitor as necessary, based on risk, these burns until declared out. Dixie National Forest is a fire-dependent ecosystem. Prescribed fire is an essential tool in maintaining healthy forest ecosystems. Prescribed fire is applied to maintain these forest ecosystems by providing healthier trees, watersheds, forage and habitat for wildlife and livestock, while reducing the threat of a large destructive wildfire from occurring in the future. Years of planning goes into each specific prescribed fire project, with priority emphasis on safety for the general public and firefighters. Care and forethought is taken to reduce the amount of the public’s exposure to smoke from prescribed fire projects. Strict guidelines regarding smoke, set forth by the Utah Division of Air Quality, must be met and followed before any ignition can begin. Large portions of these prescribed fire projects have been completed with a high level of success. The public is welcome to contact Chet Hatch at 435-676-9373 or Lyndsay Fonger at 435-676-9371 with any questions, concerns or comments. For more information on these prescribed fires and other fuel reduction projects in Utah, visit Utah’s fire information Web page on hazaradous fuels mitigation projects.